This stretches the concept beyond what the Apostle Paul intended. To be yoked with someone means you’re involved in a covenantal or contractual relationship. An employer/employee relationship is one in which you have the ability to leave should you feel your values are undermined. This is difficult in a contractual relationship. There are unique cases, but being unequally yoked is rarely an excuse for leaving your employer. The Christian view of work—that we work to serve others, not ourselves—can provide the foundation of a thriving professional and balanced personal life. 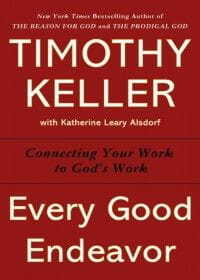 Keller shows how excellence, integrity, discipline, creativity, and passion in the workplace can help others and even be considered acts of worship—not just of self-interest. Purchase here. Originally published February 05, 2013.